IDE stands for Integrated Development Environment and is an application with a set of tools designed to help programmers execute different tasks related to software development such as writing, compiling, executing and debugging code. Before you begin using Remix to develop smart contracts, make sure you’re familiar with some basic concepts. In particular, give these articles about blockchain and Ethereum a read. A smart contract is a trust-less agreement between two parties that makes use of blockchain technology, to enforce the parties to adhere to the terms, rather than relying on the traditional ways such as trusting a middleman or using laws to handle disputes. 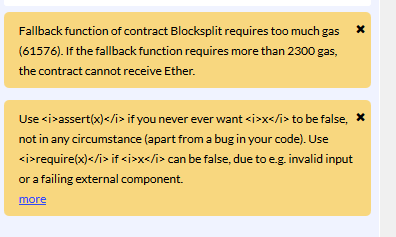 Using the Ethereum blockchain, you can create smart contracts with the Solidity language (among others). Ethereum is not the only platform that can be used to create smart contacts, but it’s the most popular choice, as it was designed from the start to support building them. Unlike the smart contract deployed on the blockchain itself, the front end of a Dapp can be either hosted on a centralized server like a CDN or on decentralized storage like Swarm. 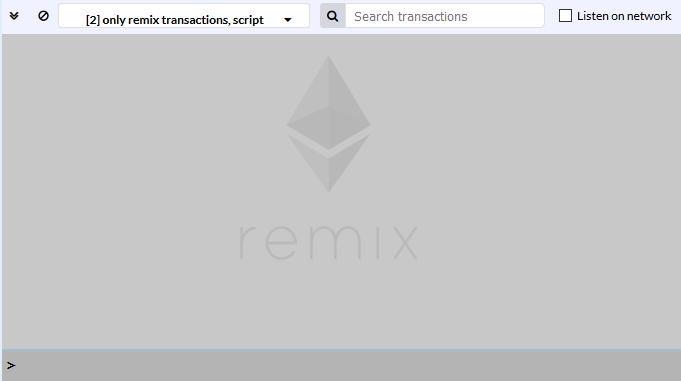 You can access the Remix IDE in different ways: online, via a web browser like Chrome, from a locally installed copy, or from Mist (the Ethereum Dapp browser). You can access the Remix IDE from your web browser without any special installation. 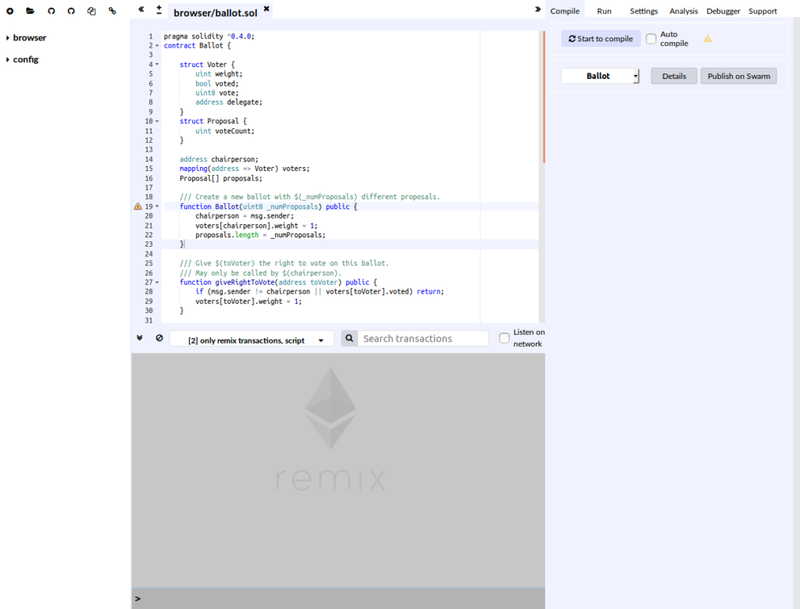 Visit https://remix.ethereum.org/ and you’ll be presented with a complete IDE with a code editor and various panels for compiling, running and debugging your smart contracts. You’ll have a default example Ballot contract that you can play with. You can start the Remix IDE from Mist by clicking on Develop, then Open Remix IDE. Remix will be opened in a new window. 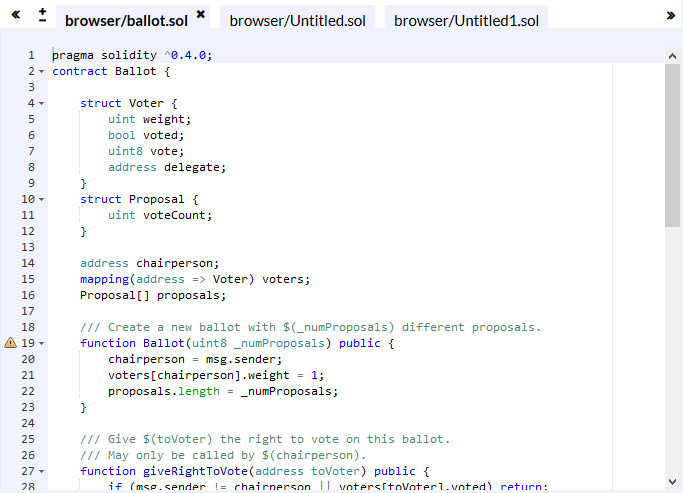 If this is your first time running the IDE, you’ll be presented with a simple example Ballot contract. To get familiar with Mist, please see this article. You need to have Node.js and npm installed. Check this GitHub repository for more information. After seeing how to open the Remix IDE, let’s now see the various panels composing the IDE. The file explorer provides a view with the created files stored in the browser’s storage. You can rename or delete any file by right-clicking on it, then choosing the right operation from the context menu. Please note that the file explorer uses the browser’s local storage by default, which means you can lose all your files if you clear or the operating system automatically clears the storage. For advanced work, it’s recommended to use Remixd — a Node.js tool (available from npm npm install -g remixd) which allows the Remix IDE to access your computer’s file system. Now let’s see the different actions that you can perform using the buttons at the top of the explorer. You can create a new file in the browser local storage using the first button with the + icon on the top left. You can then provide a name in the opened dialog and press OK. 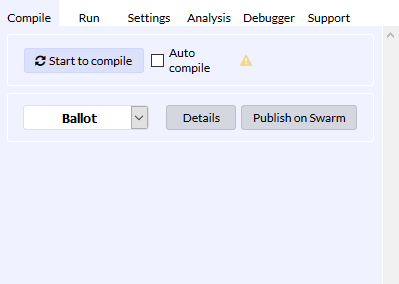 Using the second button from top left, you can open an existing Solidity file from your computer file system into the Remix IDE. The file will also be stored in the browser’s local storage. Using the third and fourth buttons from top left, you can publish files from the IDE as a public GitHub gist. Using the fifth button from top left, you can copy files from the local storage to another instance of Remix by providing the URL of the instance. The last button can be used to connect the Remix IDE to your local file system if you’re running the Remixd tool. The Solidity code editor provides the interface where you can write your code with many features such as syntax highlighting, auto-recompling, auto-saving etc. You can open multiple tabs and also increase/decrease the font size using the +/- button in the top-left corner. the Support tab: used for connecting with the Remix community. Injected Web3: a provider that injects web3 such as Mist and Metamask, connecting you to your private blockchain. Web3 Provider: a remote node with geth, parity or any Ethereum client. Can be used to connect to the real network, or to your private blockchain directly without MetaMask in the middle. see example reads and writes in the terminal IDE. The players array variable, which holds the addresses of the raffle participants. The winners array variable, which will hold the addresses of the winners. The charity variable, which holds a hardcoded address of a charity where profits will go. A fallback function marked as payable, which enables the smart contract to accept payments. A play() function that enables participants to enter the raffle by providing an address. You can read more details about this contract from this tutorial where all the code is explained in detail. 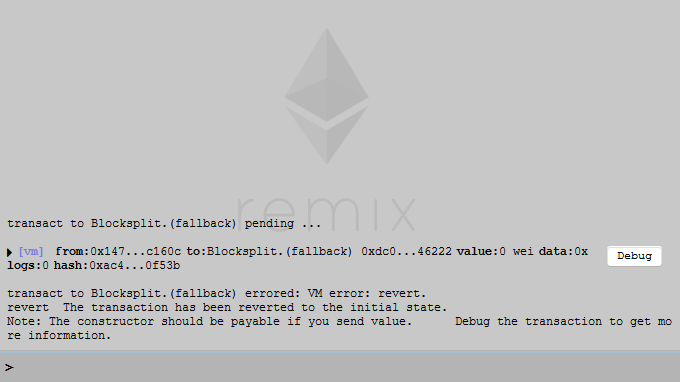 Now, go ahead and open the Remix IDE from remix.ethereum.org. Next, create a new file by clicking on the button with the + icon. A new tab will be opened in the code editor where you can start writing your contract. So just copy and paste the previous contract code in there. First start by compiling the contract. From the Compile tab click Start to compile button. We’re getting a message box with two warnings raised by Static Analysis of the code. The first warning is raised if the gas requirements of functions are too high, and the second one is raised if the require() or assert() functions are not used appropriately. 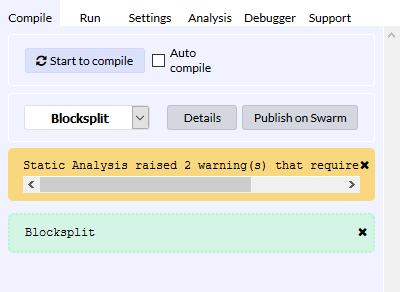 You can also use the checkboxes in the Analysis tab to determine when you want the compiler to emit warnings. Next, click the Deploy button below the contract name. Under the name and address of the deployed contract, we have some buttons with red and blue colors. 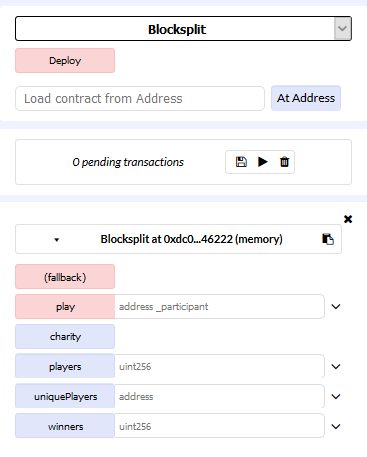 Red buttons refer to actions that cause a write to the blockchain (in our case the fallback and play functions) and need a transaction, where blue buttons refer to reading from blockchain (charity, players, uniquePlayers and winners public variables we defined in the contract’s code). You’ll also see a similar message to the following screenshot in the IDE terminal. For now, the only variable that holds a value is the charity variable, because the address is hardcoded in the code so if you click on the corresponding button you’ll get the value of that address. The contract is built to allow a participant to enter the raffle by just sending ether to the address (using a payable callback function) or also call the play() function with the address of the participant. 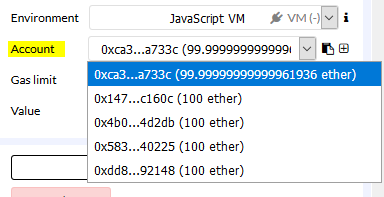 Now, to send money to the contract, we first set the Value variable (between 0.001 and 0.1) and the unit (ether) from the dropdown menu. Then we call the fallback function by simply clicking on its corresponding red button. That’s it. We’ve sent money to the contract. The address of the selected account should be added to the players array. To check that, simply click on the blue players button. You can add other participants by selecting a new account and repeat the previous process (to check if an account is added to the array simply enter the index, from 0 to 4, for that account in the text-box next to players button). Truffle: advertised as the Ethereum Swiss army knife and claims to be the most popular development framework for Ethereum with a mission to make your life a whole lot easier. We’ll be working with Truffle a lot in upcoming tutorials. Embark: a framework that allows you to easily develop and deploy Decentralized Applications (DApps). MetaMask: a bridge that allows you to visit the distributed web of tomorrow in your browser today. 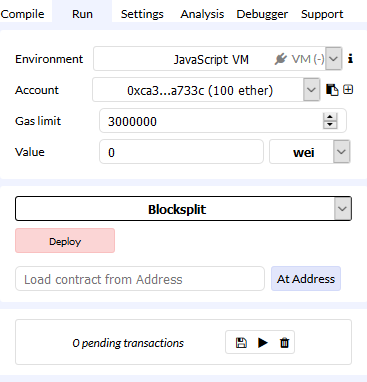 It allows you to run Ethereum DApps right in your browser without running a full Ethereum node. For how to develop with MetaMask, check this faq. Dapp: Dapp is a simple command line tool for smart contract development. different plugins for adding Solidity support to popular IDEs such as this Visual Code plugin and this Atom plugin etc. 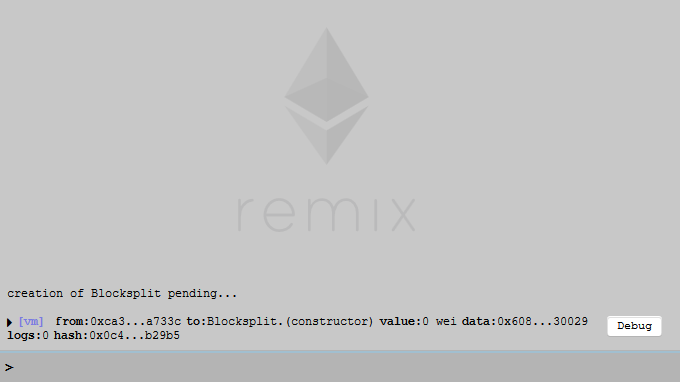 We’ve introduced you to the Remix IDE for developing smart contracts for the Ethereum blockchain. You can find more detailed information in the docs. With a basic introduction behind you, feel free to dive in deeper and experiment with changing the code and exploring the different functions and tabs the editor offers.